When an office wants to ‘go green,’ managers often talk about being paperless. But that reasoning may be flawed given the sustainable features of paper and the environmental impacts of switching to electronic communications, says Two Sides, an independent, non-profit organization Resolute recently joined that was created to promote the sustainability of print and paper. One of their main goals is to dispel common environmental misconceptions by providing users with verifiable information on why print and paper is an attractive, practical and sustainable communications medium to reach customers, educate students and collaborate with co-workers. Two Sides produces myth-busting factsheets, engaging video and fresh content to share the facts about forest management, paper manufacturing and the environmental footprint of print communications. For example, rather than asking which is better, paper or electronic communication, Two Sides explains that we should be working to find the right combination of the two that has the lowest impact on the environment while meeting our social and economic needs. 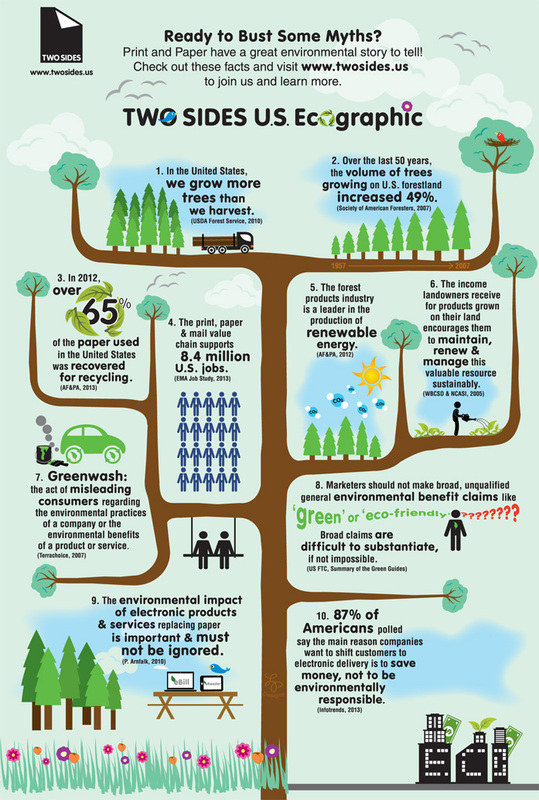 We can’t just ignore the environmental impact of electronic services that are used to replace paper. For example, Two Sides cites findings from Internet security software maker McAfee that estimates spam wastes 33 billion kilowatt hours of energy each year – which is about the same greenhouse gas (GHG) emissions as 3.1 million passenger cars using 2 billion gallons of gas, enough gas to drive around the world 1.6 million times. And that’s before you even get to the content you were looking for! And what about the 47.4 million computers that were either thrown away (29.4 million) or collected for recycling (18 million) in 2009 (which is the most recent data available)? Only 38% of computers were collected for recycling back then, compared to the U.S.’s paper recovery rates of 65% in 2012. Paper is recycled more than any other commodity in the North American municipal solid waste stream – and that includes plastics, glass and metals. The fibers from recycled paper can be used and reused up to seven times to produce new documents, packaging and other paper products. Electronic waste, on the other hand, contains substances that can contaminate air and water if they are not disposed of properly. According to the U.S. Environmental Protection Agency (EPA), over 215 million mobile devices, computers, televisions and other electronics were discarded in 2009 and only about 25% of those were recycled (by weight). Active in North America, Europe, Australia, South Africa and South America, Two Sides includes members from the entire print and paper value chain, including forestry, pulp, paper, inks and chemicals, pre-press, finishing, publishing, printing, envelopes and even postal operators. Check their website for more information on the impacts of the forest products industry – that is sustaining long term woodland management, supporting literacy and learning and helping people, especially seniors who may not have Internet access at home, stay informed and up to date on their bills by receiving paper statements at home. For more information see twosidesna.org and connect with Two Sides on Facebook, LinkedIn, Twitter and YouTube.